Post-Traumatic Stress (PTS) symptoms if allowed to persist during childhood or adolescent years often leaves the individual more susceptible to relationship and mental health issues such as depression or low self-esteem. Ms Yee shares on how PTS symptoms can be identified early so that children can receive early intervention to prevent inhibition in their education and personal development. In Singapore, it can be difficult to identify with the word trauma. What are some possible causes of trauma for a child? Trauma is defined by the person or child who experiences it. Any time a child does not feel safe and protected, it can be seen as a traumatic experience. Therefore depending on the individual child, causes of trauma may vary from cyber bullying to exposure to violent movies. Witnessing a major road accident, the death of a close relative, or experiencing sudden hospitalisation due to illnesses, all these are also possible traumatic experiences for children. See list of Trauma Causes. In one case, a student was referred to us as he frequently picked fights in school and was deemed uncooperative and defiant. The boy was easily angered and his outbursts was explosive. We observed that he was very withdrawn and prone to mood swings. Through assessment I realised that he had been traumatised at a young age due to harsh beatings and this in turn affected his perception of adults and hence led to his violent behaviour. Due to the nature of his PTS symptoms, we brought him through Trauma-Focused Cognitive Behavioural Therapy (TFCBT) to provide psychoeducation to both the child and the caregiver and help them to identify and cope with emotions, thoughts and behaviours. After multiple sessions which involved his caregiver as well, the boy showed improvements and became more cheerful. Even though he still got angry now and then, he could be reasoned with. The school also gave us feedback that they have seen much improvement in him. What should parents be on a look out for? Traumatic grief may result in psychosomatic symptoms. Children might complain of headaches or stomach aches, but upon seeing the doctor, the doctor declares them physically well. You have no clue why they are expressing themselves in this manner. It may seem as though they are using this as an excuse not to eat or go to school. Unexplained anger outburst may lead parents and caregivers to the conclusion that their children are becoming naughty and don’t want to follow instructions. Some very young children may become extremely clingy to their parents. Parents who know their children well will be able to realise the difference before and after the trauma incident. Other signs to look out for include a loss of focus and concentration during the child’s study or even play time. An obvious sign would be a sudden drop in academic results in a normally conscientious student. In some cases, children may even feel an urge to run away from home or any scene or person that reminds them of the trauma incident. Is there a sudden change from my child’s usual behaviour? Has the child lost interest in things he/she used to do and like? Have a clear understanding of your children’s interests and hobbies such as their favourite food and hobbies such as singing or drawing. A sudden loss of interest in their favourite activities is a strong indicator that they may be troubled by certain events. For more information, refer to Temasek Foundation Cares KITS (Kids in Tough Situations) brochures available here. My child shows symptoms of post-trauma stress. Does that mean we need to seek help? Give your child time to overcome post trauma stress and make sure you keep your communication channel open. It is common for both adults and children to experience flashbacks of the traumatic event. Talk to your child and find out if he or she is having nightmares or flashbacks. You may also prompt your child to share with you his or her thoughts on the recent event which might be the cause of stress. Help your child to understand that it is normal to feel grief or anxiety for a period of time. As long as your child is able to function and return to daily routines within a month after the traumatic event, there is no need to seek therapy. The need for therapy arises when the child’s daily life becomes affected by depressive symptoms such as a lack of motivation, loss of appetite, and avoidance of places such as school. This may lead to more behavioural problems and affect the child’s social and emotional development. Don’t hesitate to approach either social workers or school counsellors for professional assistance. It is best to resolve the issues early before things become worse. Be aware that the Trauma-Focused Cognitive Behavioural Therapy (TFCBT) involves not just the child but also parents or caregivers. You play a very big role in maintaining the therapeutic effects for the child and helping with your child’s recovery. Do you frequently come across cases of PTS in children? I can’t comment much or provide statistics with regards to this specific question. But since 2015 when the TFCBT for social workers was introduced to help children and teens cope with trauma, Bethesda Care Services (BCS) has been referred many cases and has seen about 6 such cases. This represents a very small fraction of the cases we manage here in BCS. However, when I look at the other types of casework we handle – marital counselling, emotional, behavioural or family, I find that many have experienced trauma during their childhood and teenage years. In one case, when we traced the family background of a client, we realised that he had gone through trauma, but it was not treated in his younger days. It affected him even though he was not aware of it. He had a lot of insecurities which led to unhealthy connections. He fell victim to addiction before he realised he needed to seek help. Therefore, as much as possible, we need to learn to identify PTS symptoms and not let it progress into adult life. Helping a child emotionally is very rewarding. Because you realise that the child is able to function better and view the future more positively. Self-harm and safety issues will be resolved and he is able to take care of himself and love himself more. And you know that this child is able to move on and face bigger challenges in life, rather than being defeated and crushed by the events. 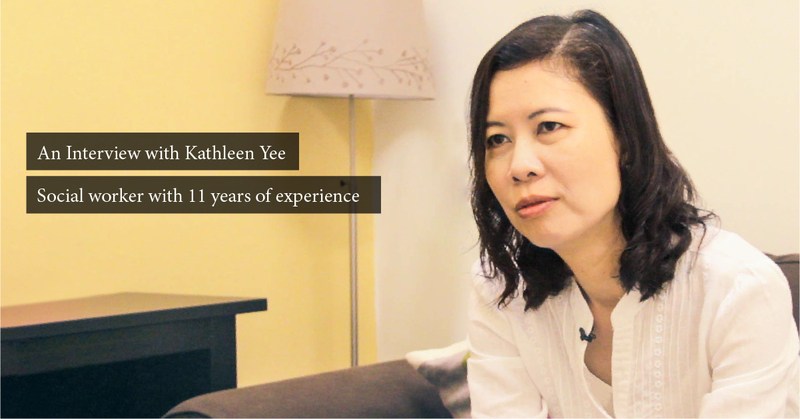 Ms Kathleen Yee is a mother of two and has 11 years of experience as a social worker in Bethesda Care Services. She finds it meaningful to invest time into other people’s lives and finds it satisfying to be able to improve a person’s quality of life through any means of help. The helping profession is not just giving people advice, but empowering them through the realisation that they have the potential and resilience to overcome their problems. Bethesda Care Services is located at 300 Bedok North Avenue 3. Our Family Services offers professional casework and counselling services, as well as Welfare Assistance and a myriad of other services and programmes. If you are keen to join BCS as a volunteer, do contact us through our online signup form. For more information, please visit our website or our Facebook page.